1 How are Workplaces linked to Locations? 2 How do I link a new workplace to an existing location? 4 How do I unlink a location from a workplace? 5 The location record is already set up. Why can’t I see it when I try to link my workplace to it? 6 Can I still have locations that are not linked to workplaces? 7 How can I see which locations are linked to workplaces? 8 How do I edit a location that’s linked to a workplace? 9 What if the address changes? 10 Do I still have to add a location to the enrolment? 11 Do I still have to add a workplace position to the learner or enrolment? 12 How do I remove a Workplace Contact? 13 How to delete a Workplace? How are Workplaces linked to Locations? If you’ve got a workplace that is also a delivery location, you can link the two records together in Wisenet. Then all details (location fields and workplace fields) are visible and editable in the workplace record. How do I link a new workplace to an existing location? 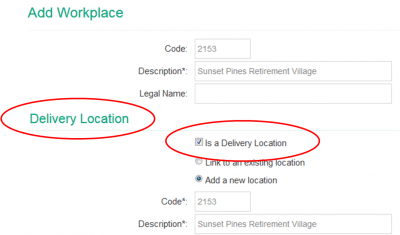 When you’re adding a workplace, put a tick in the checkbox that says Is a delivery location and choose link to an existing location. How do I unlink a location from a workplace? The location record is already set up. Why can’t I see it when I try to link my workplace to it? The Dropdown will give you a list of all unlinked locations. If the location is already linked to another workplace, you won’t see it in the list. Can I still have locations that are not linked to workplaces? How can I see which locations are linked to workplaces? How do I edit a location that’s linked to a workplace? What if the address changes? Address change? Just change it in the workplace record. The location record address automatically stays in step. If the location and the workplace don’t have the same address then they probably should not be linked. Do I still have to add a location to the enrolment? Almost certainly. If you’re reporting to the government then yes, definitely, because delivery location is a required field for pretty much every government compliance export. The difference with having workplaces and locations linked is that you don’t need to maintain two separate records for an organisation that is both a workplace and a location. Do I still have to add a workplace position to the learner or enrolment? That depends on whether the learner actually undertakes a placement there or not. It’s up to you, really. If you need to record position details such as start and end dates and supervisor, then yes you probably should still add a workplace position. How do I remove a Workplace Contact? How to delete a Workplace? An error message stating that there are child relationships means that the preparation steps above have not been completely carried out.